Serving in the military may be the toughest thing you've done but getting money for school shouldn't be. You've served us. Now let us serve you. Contact us to find out about exclusive opportunities and benefits available to military personnel. Students are the heart of RSI. We’re proud of the strong partnership between our staff and students. We know adjusting to a new environment can be difficult, so we build a bridge for our students by providing ongoing support and guidance. Our team provides a host of student services including housing assistance and when you graduate, we provide Career Services assistance. 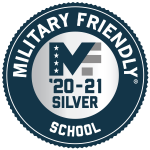 We also provide special attention and assistance for our students who are either currently serving or have served in the military.